Company information 1) Our company has our own independent production base, five years experience, professional manufacturing technology, and a strict quality control system. If you are interested in our product or in need of establishing long-term business relations, please feel free to contact us. It can be free to let go and park, without worrying about sliding; 9. Function of nesting, overlapping and stacking push. Q:What do you pack with your products9 A:Carton and bubble bag. - We can produce according to your own design or your requirement. Please send us inquiry to get further details and favourable price. 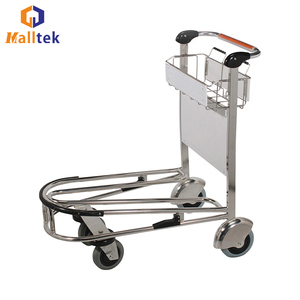 Airport Luggage Trolley Supplier 1. Load Carrying Capacity ( 250kg ) 2. 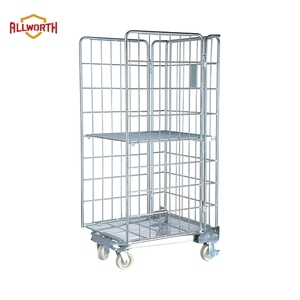 Approx Weight per trolley ( 20kg ) 3. Overall Dimension(L*W*H) 980 mm*650 mm*1015 mm 4. Basket Size(L*W*H) 495 mm*220 mm*150 mm 5. Wheels Dimension Fixed caster ( 180mm ) Swiel caster ( 125mm ) 6. AD plate ( 570 mm*370 mm ) 7. Body Material (201)Stainless steel/ (Q235)Steel 8. Material of Main parts Basket&mdash; Stainless steel/ (Q235)Steel Joints&mdash;PA , PP Fixed caster&mdash; Nature Rubber Swiel caster&mdash;TPU Handle&mdash;PVC Detailed parameter as follows: Body material (201)Stainless steel/ (Q235)Steel Basket material (201)Stainless steel/ (Q235)Steel with powder coating Joints PA,PP Length 980mm width 650mm Height 1015mm Basket size 495 mm*220 mm*150 mm Load capacity 250kg Approx Weight 20kg Casters 2 swiel casters and 2 fixed casters Casters specifications Fixed caster ( 180mm ) Swiel caster ( 125mm ) Main advertisement panel size 570mm*370mm Wheels Fixed caster&mdash; Nature Rubber Swiel caster&mdash;TPU Handle PVC Warranty : 1 years Shipping and Delivery: OEM in 20 days , accept customerized size and weighing capacity. 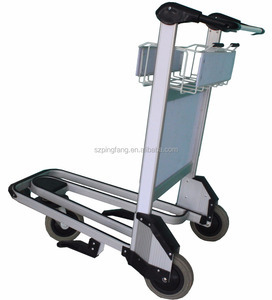 9 YRS Suzhou Pingfang Industrial Co., Ltd.
Airport Steel Baggage Cart /Pallet trolley/Bulk cargo trailer for aviation ground support equippment Color : paint or Galvanised Capacity:2T Any special request pls feel free to contact us. Independent research and development of products and services the company has received a large number of enterprises at home and abroad on the recognition and praise. The company has invested millions of RMB in introducing domestically leading productive equipment and testing facilities to ensure the elaborateness of every link of production and every piece of products. In terms of technology, the company keeps in pace with the development of modern science&technology and material, constantly develops science&technology,surpas- ses oneself and launches high-performance products. . Weight: 20kg; 3. Material: Aluminum alloy; 4. Dia. Of caster: 180mm; 5. Overall size: 1110*590*1060 mm; 6. Size of basket: 570*220*150mm; 7. Size of big adv. Board: 570*470 mm; 8. With/without brake; 9. Material of handle: plastic PVC, flat shape. 4. We will offer good suggestion for you to help you save more money and more time . 5 . We always do our best to solve all the problems and put our customer's interests in the first place. PLUS : we also have many other size and type for our customers all the parts of platorm hand trucks are produced by our factory. 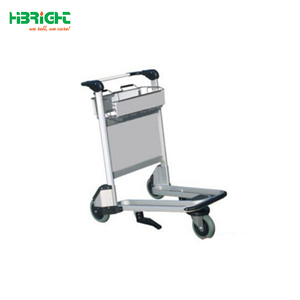 WBD folding stainless steel aluminum alloy railway station airport passenger hand luggage trolley Carts are important in the greenhouse industry for moving plants. For example: plywood greenhouse cart, expanded steel flower cart, greenhouse trolley, Danish trolley, Danish cart, plant transport cart, etc. Which specializes in light duty shelving, medium duty racking, heavy duty ones and various storage and shelving solutions for over 15 years. 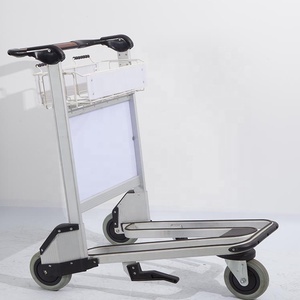 Alibaba.com offers 4,342 airport trolley products. About 26% of these are hand carts & trolleys, 13% are luggage cart, and 7% are shopping trolleys & carts. 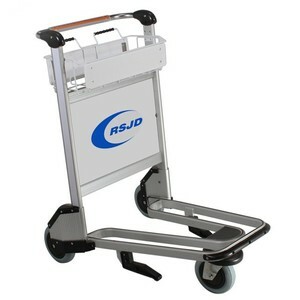 A wide variety of airport trolley options are available to you, such as stainless steel, aluminium, and plastic. You can also choose from tools, shopping, and storage. As well as from platform, enclosed, and roll container. And whether airport trolley is three-wheel, or four-wheel. There are 4,342 airport trolley suppliers, mainly located in Asia. 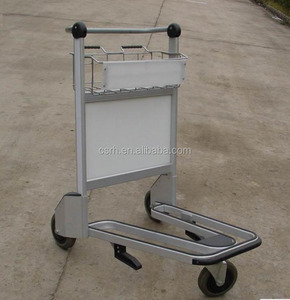 The top supplying country is China (Mainland), which supply 100% of airport trolley respectively. 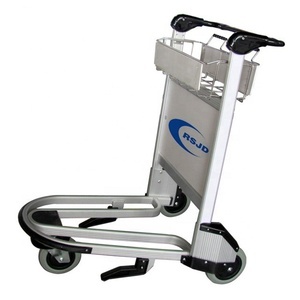 Airport trolley products are most popular in North America, Western Europe, and Domestic Market. You can ensure product safety by selecting from certified suppliers, including 1,462 with ISO9001, 557 with Other, and 262 with ISO14001 certification.